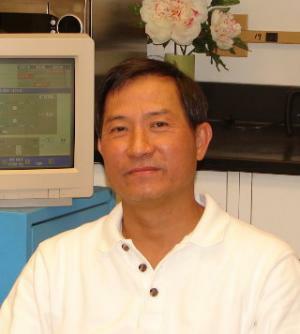 Before coming to the Byrd Center, Dr. Lin participated in a marine geophysical survey, aboard the R/V 'CHIU-LIEN' (National Taiwan University) and in the 1985 Seamount lava dredging, aboard the R/V Thomas G. Thompson (University of Washington). He served as a meteorologist in the Air force military service, Taiwan. He also gained experience in geothermal stable isotope (oxygen and hydrogen) studies while working for the Industrial Technology Research Institute, in Taipei, Taiwan, R.O.C. His current research involves the analysis of stable isotopic (oxygen and hydrogen) ratios in ice cores collected from many parts of the world. He is also exploring the use of trace amounts of Nd and Sr isotopes as indicators of moisture source history.